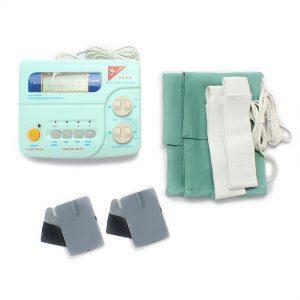 An EMS machine is used to relieve pain, reduce spasms and edema, tonify weak muscles and assist the healing process. It is known to ease muscle tension, stiffness in joints or back areas, and known for increasing motion restricted from disuse or atrophy, electronic muscle stimulation can also increase local blood circulation. 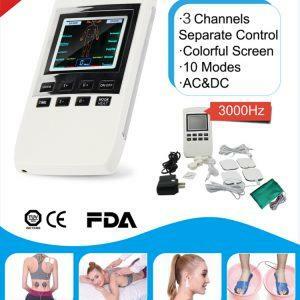 Trans-cutaneous electrical Nerve stimulation 4 channel, 4 pairs of rectangle rubber electrodes. Four independent outputs can be used by four people at the same time. Pulse monitor is the indicator of the output time. Pulse length is adjustable from 1s to 1.4s, totally nine level. Four regulating knob to adjust the strength. Used in local slimming of body parts and weight loss. Helps relax muscles and relieve muscle cramps. It is used in the treatment of pain, joint inflammation and relief of rheumatic pain. It is used to stimulate the blood circulation of the body. Power voltage and frequency low frequency variable voltage power supply is DC9V 100MA. Four-way separate output, strength adjustable. Pulse stops and outputs time : 920ms-1.52s adjustable. 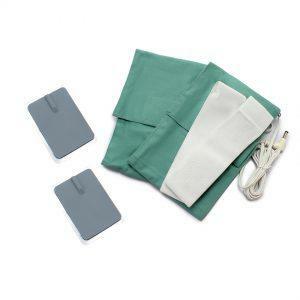 4 pairs of rectangle runner electrodes.